I can remember my mother collecting Precious Moments when I was very young, she still collects them today. She passed her love for these precious figurines onto to me. I love that the Precious Moments figurines are beautiful and unique. Each one brings to mind a treasured memory. I am excited to be out here today telling you about the Precious Moments Collectors Club which produces exclusive one of a kind figurines that can only be purchased by members. By becoming a member of the Precious Moments Collectors Club you can enjoy exclusive benefits and figurines that will continue to touch your heart. I was given the wonderful opportunity to select and review one of the exclusive members only figurines. I chose one figurine out of three and I have to be honest. It was a tough choice. I chose "Blessed Are The PeaceMakers" So many times when I choose Precious Moments figurines I choose the one that at the time has a deep meaning to something that may be going on or how I am feeling. These are adorable. I love that these are unique to any other figurines I have ever seen. They pay very close attention to the fine details. The inspirational messages that come with the figurines are touching. 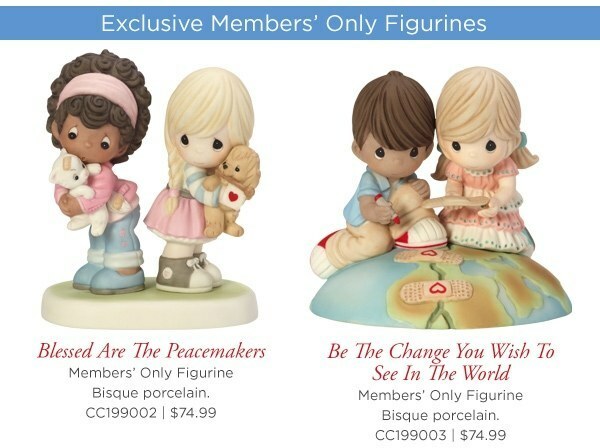 The "Blessed Are The Peacemakers" Bisque porcelain figurines are sweet, adorable little friends demonstrating the importance of being peacemakers. In their most heartwarming way they never give up their hope for peace, love and harmony between their cute furry friends. The Club theme for 2019 is “Sharing Love, Peace, and Harmony With The World”, a message to inspire each of us to remember that simple gifts from faithful hearts really do make the world a better place. What a beautiful and wonderful message to send the world. These figurines are meticulously sculpted in bisque porcelain. They are expertly hand-painted so that every detail is beautiful. The figurine is approximately 5.5H x 4.75W x 3.25D inches. Precious Moments began more than three decades ago with creator, Sam Butcher. Sam began drawing the endearing teardrop-eyed children he called "Precious Moments," as gifts for his family and friends. Today, his Precious Moments artwork is among the most recognized art in the world, sharing messages of loving, caring and sharing with collectors from around the globe. Sam Butcher is a man of deep personal faith and conviction. He demonstrated artistic talent at an early age, encouraged by his mother. Sam pursued formal art training following his high school graduation. His dedication earned him a scholarship to the College of Arts & Crafts in Berkeley. There are many gift ideas for these adorable figurines, birthdays, anniversaries, baptisms, graduations and so much more! Precious moments items are so cute!! I didn't know that they had a club, that's very neat! Nhow cute! 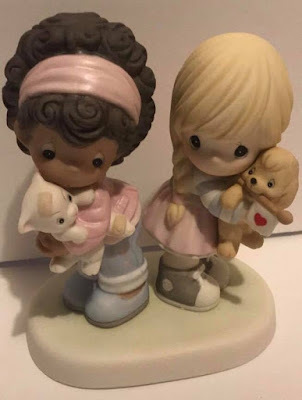 Precious Moments figurines are always so sweet and have a message worth hearing.